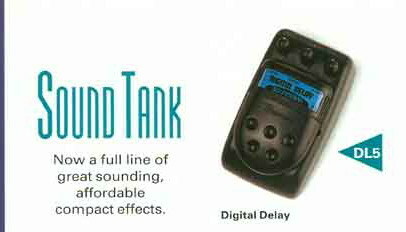 DL5 Digital Delay, Delay/Echo/Phrase Sampler for Guitar from Ibanez in the SoundTank series. 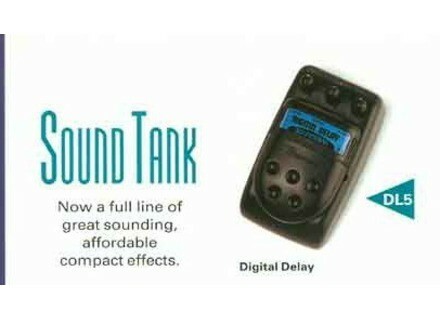 Digital delay, time-feedback-level, approximately 400 ms BUT you can change it! It's the whole point of the thing, I bought a second so that's good. This is not seen is the sound of this super cool pedal. It's very simple on the outside. Mix to 50 percent maximum not to parallel effects loops. Originally set the sound is very transparent but not cold, with a modest time of 400ms max. When disassembling, surprise, two trimpots can act on the maximum delay time and the cleanliness of sound, the game is to find a balance still okay because as time increases more processed signal degrades. It's great to be able to choose what we want, right? The internal mix is ​​very well done, the depth of the effect was more relief than usual, and she lives with the guitar. Difficult to describe but to actually use it and definitely needed, as in clean saturax. It's as if she had to mix equal more depth of field in fact. With the experiments were internally all you want, a fabulous toy, o surprise and a bit of dirt in the sound does not interfere at all with music. Amazing. It's been a while since I have them, and frankly what is good. I connect as follows: guitar in both groups (crunch-delay, and lead-delay, four pedals) that are selected by an ab box. Extremely simple and very effective. As for the footswitch bin temperamental in my set-up but it does not matter if it makes the time ripe. His sister was totally amazed EM5 the staff of the guitar player usa at its output, it is of the same stamp for the fans. The best for last, on ebay for approx. 20 euros a piece that I've caught.